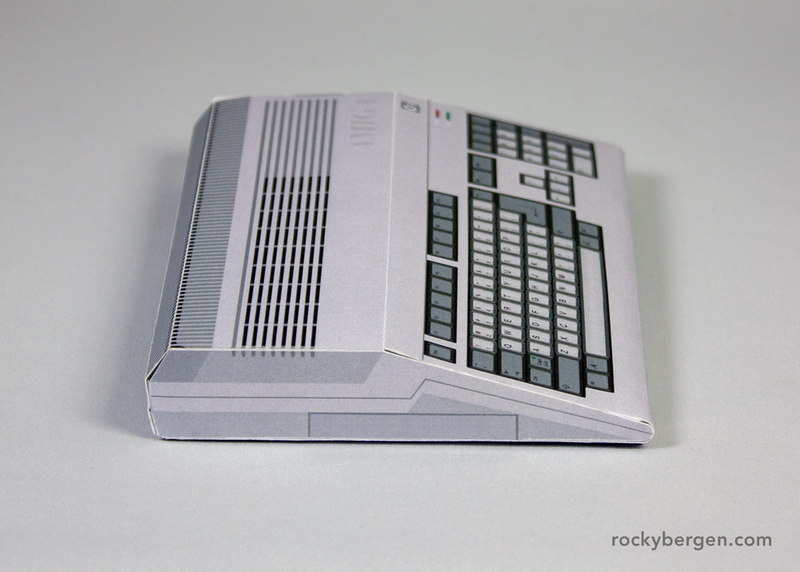 The Amiga 500 papercraft comes complete with Workbench 1.0. You can find the download for this pattern at the bottom of this post. I was in high school when the Commodore Amiga came out. The Amiga wasn’t very popular in my rural Canadian town and I only knew one kid that had one. I had grown up on a steady diet of Commodore so I was primed to be an Amiga fanboy. I read a lot of computer mags and was armed with plenty numbers that could prove how the Amiga was better than the PCs at school. By the time I graduated, Commodore had gone out of business and Amiga was no longer a viable purchase In my mind. It wasn’t until I went to university that I got to use an Amiga 4000 with the Video Toaster. Fantastic non-linear editing for its time and such a shame that Commodore was no longer around to innovate. The Amiga 500 had an integrated 3.5” floppy disk drive. Some day I will make some tiny blue disks. Amiga expansion port in case you were interested in making this beast even wider. A couple of years ago, I bought an Amiga and that awkward A-520 Video Connector. I spent the better part of a week trying to get an image to show up on my TV. A few weeks later, I ordered a pizza and when the pizza guy poked his head in my apartment he said, “Sweet Amiga! You need a monitor and some games for free?” Of course, I said yes. Problem is, I have never had any success getting the Amiga to do anything. Now, I have a Raspberry Pi that emulates the best parts of the Amiga experience and it took minutes to setup. I think I spend so much time making these patterns to atone for all this blasphemy. Several swappable screenplates of popular games are included with the pattern. Here’s James Pond. I chose the Commodore 1084S-D1 monitor to go with this Amiga design. I added extra geometry to this pattern but it is still very easy to fold and very strong. There are a few additional folds on this new monitor design but it’s still easy to assemble. I am not sure if there was an official Amiga monitor at the 500’s release so I chose the 1084S-D1 because it looked period correct and is IMO the most attractive Commodore monitor of the day. Pinball Fantasies - Hit those ducks. If you enjoyed this post and would like to see more of the same please consider hitting the Like button, it helps me know what I should be working on.